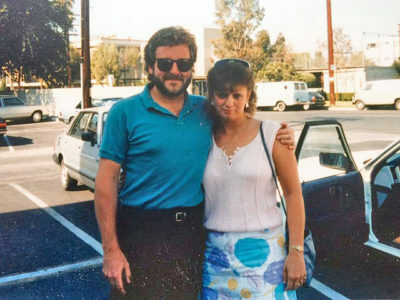 Here’s a very young, ambitious Lori and the handsome Jeff Hamilton in 1987 after I had just moved to L.A. to pursue my dream of being a famous jazz pianist. On that particular day, I met our dear family friend Jeff Hamilton for lunch. I’ve known Jeff for years – since I was about 6 years old. He took drum lessons from a man named John McMahan, who happened to teach at my father’s music store in Anderson, Indiana. Jeff and my brother Mike became good friends, because they were in a drum line together. And since Jeff made the weekly drive from Richmond, Indiana to take lessons, he would sometimes come to our house and hang out. We certainly saw Jeff’s career take off. He played with Woody Herman, Monty Alexander, Ray Brown, Count Basie – the list goes on forever. Our lunch – when the above picture was taken – was particularly memorable for me, because Jeff had been playing with Ella Fitzgerald, and he was telling me about her health decline. I could feel how much he loved her. All I could think was WOW! Jeff was gracious enough to put me in contact with other great musicians. Little did I know I would meet one of his and my brother’s friends, Roger Spencer (who is now my husband). Jeff and Roger played in the Bill Holman band together. We’re so excited that we get to see Jeff this weekend when he brings his fantastic trio back to the Nashville Jazz Workshop for another sold out performance in the Jazz Cave!